We’ve got an exciting Summer ahead of us at Kobas. We’re working hard on some new functionality that will come in time to make your Christmas trade smoother and more straightforward – allowing you to spend more time delighting your guests and less time on admin. And the best news is that we’ve started releasing our first updates today! Our goal for this project is to have a new bookings system in place in Kobas Cloud in the Autumn, ready for you to kick off your festive season. It’s a big job, and one we’ve broken down into a number a stages. As we finish a stage we’ll release it and then start work on enhancing that functionality to take it to the next level. This way of working allows us to gauge the response from our users quickly and get valuable feedback to inform the next stages of work, and it also means you start seeing the benefits of what we’re doing sooner. So, in line with this methodology, we’ve just released stage one of the project! You now have the ability on EPoS to take a Deposit Redeemed type of payment towards a tab. Perhaps on its own that doesn’t warrant a huge fanfare, but it provides some very fundamental groundwork for the more advanced stages of this project. To explain how it works – when taking a part payment or settling a tab, on the Pre-Paid tab of the payment screen, you will now see a large button labelled Redeem Deposit. Pressing this button currently opens a number pad where you can enter any value for the deposit payment (in future we hope to link this up with a list of deposits previously received in Kobas). The value of the deposit is then added as tab credit, or contributes to the paid portion of the bill if orders have already been placed. The ability to use the new Redeem Deposit functionality is locked to a new EPoS permission –Redeem Deposits And Other Payment Types. To make your lives a little easier, this has already been granted to any users with the Price And Discount Availability Override permission. If that doesn’t suit your specific set up, it’s simply a case of editing the user levels for each level that should or should not have access. 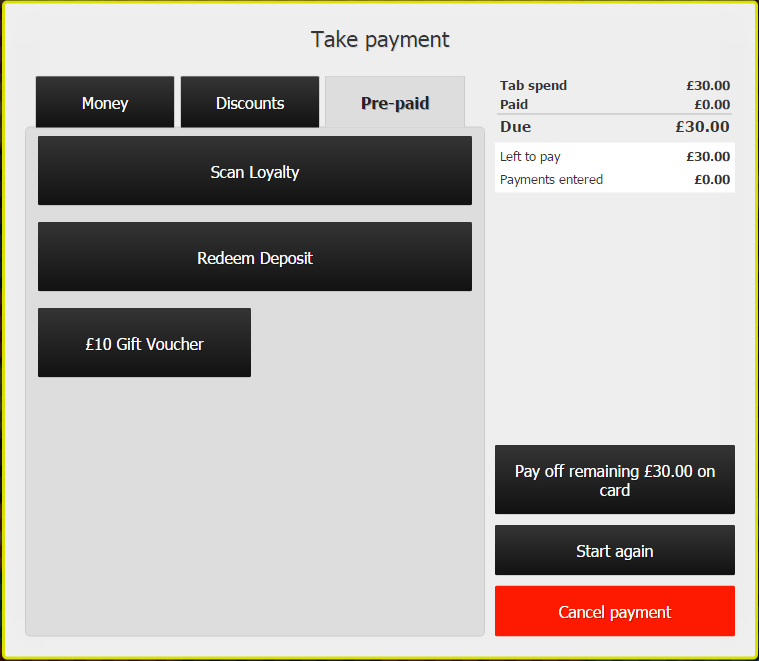 Expect to see this new functionality arrive on your EPoS in the next week or two. The new permission name is perhaps a bit of a giveaway, but we’re also currently working on support for custom payment types on EPoS, i.e. anything that would not fall under the cash or card categories. We envisage this being used for things like orders on corporate accounts or for orders placed through 3rd parties. For example, many of our clients utilise 3rd party online ordering systems such as Deliveroo or City Pantry. However without putting these orders through your EPoS, it is hard to reconcile any stock usage correctly. Similarly, going ahead and putting 3rd party orders through EPoS has required some creative workarounds to ensure all cash logs balance correctly – but thankfully not for much longer. Soon you will be able to provide us with a list of custom payment types for your organisation, and once set up they will be accessible through a new Other button on the payment screens for orders and tabs, alongside Cash and Card. These payment types will appear on your daily cash declarations and feed into cash logs and reports, giving you the benefit of accurate stock and payment reconciliation in Kobas – even when orders have been placed in non-standard ways. More on this and other updates as they come, but we’d love your feedback on the new deposits functionality. Here’s a guide showing you exactly where to find it, but as always, our Support team will be happy to answer any questions you may have.